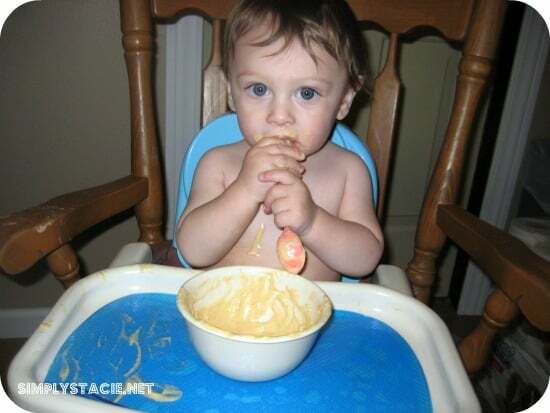 I have been struggling to get my almost-10-month-old son Caleb to eat anything lately. I watch his little buddies gobble down whole foods, while I still struggle to get him to eat purees. That being said, I am open to anything that makes the eating process simpler. Enter the Highchair Helper. Any Mom knows that trying to use bowls and plates with an infant or young toddler is an exercise in futility; everything will wind up on the floor, or possibly the walls. 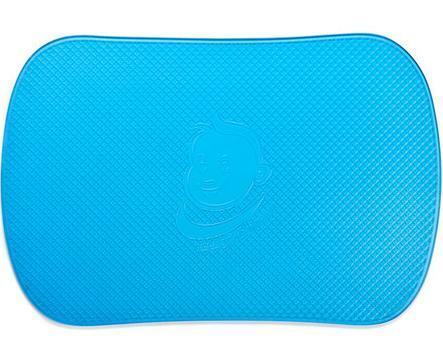 Jenn Rhoades found this out the hard way and decided to create a solution – a sticky mat which sticks to both the highchair and the plate or bowl. Even though Caleb is still young, I decided to try out the Highchair Helper. My goal is to keep exposing him to foods in hopes that one day he will start to like them. 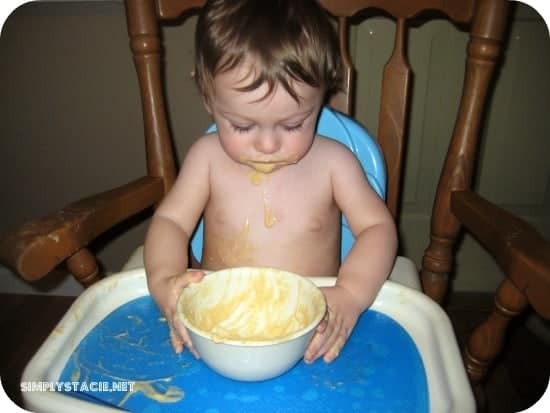 So, why not give him a whole bowl of baby food and let him go to town? Even if he doesn’t eat it, I wanted to let him play with it and feel the textures – without throwing bowls on the floor. We have a Fisher Price booster chair, and the Highchair Helper fit well in the tray. I put my bowl of pureed sweet potatoes on top of the mat and gave it a little nudge to make sure it was secure. Caleb made an absolute mess, but that bowl never moved. I watched Caleb try to move the bowl (and he is a strong little guy, I assure you) but it never budged. I noticed there was a weird bubble when I pulled the bowl off of the Highchair Helper, but this was just from where the bowl was attached. I un-stuck the mat and re-attached it and it went away. It was easy to wipe clean. My only challenge with it was how to store it. Because it’s sticky, you don’t want to just lay it anywhere. It’s currently laying over the middle part of my kitchen sink, and that is working out well. We have a black sink so the blue mat blends in well. 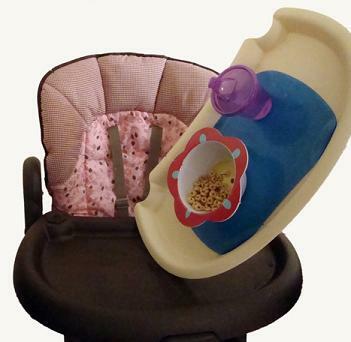 You can buy your own Highchair Helper online for $24.95 (U.S. addresses only). It’s BPA free! That’s most important for my baby due in a few weeks. easy to clean with water and a damp. I learned that it will stick to any surface! I definitely need this!! You can twist the items clockwise and they will unstick… pretty cool! Thanks! If the surface is too small you can hang part of the Highchair-Helper over the side or you can cut the Highchair-Helper to fit with heavy duty scissors or meat shears. It sticks to any surface! Easy to clean (YAY!) and BPA free! It sticks to any surface…great! I learned its BPA free. Yay! I learned that the Highchair helper is BPA free, Phthalate-free, and PVC-free. Durable and lasts up to 6 years. I learned that the Highchair-Helper is made from a non-toxic polyurethane gel that is BPA free, Phthalate-free, and PVC-free.